Derwent is another name familiar to artists and is another company with a long and interesting history. There is even an interesting Cumberland Pencil Museum to investigate on a tour of the Lake District. 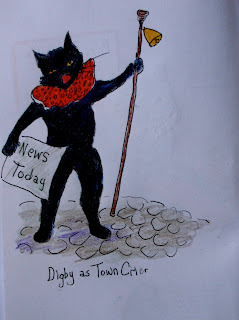 Graphite was first found in the Lake District near Borrowdale, Cumberland in the 1500's when a violent storm uprooted some trees and sheep farmers found the black material discovered was handy for marking their animals. It remains the finest and purest graphite in this solid form ever found. It was easily sawn into sticks. Another valuable use for the graphite was to line the moulds for cannon balls so the mines were taken over by the Crown and guarded. Then they were flooded to prevent theft until more was needed. However, graphite was still smuggled out for pencils. A famous smuggler of graphite was Black Sal in the 18th century. He raided the "wad mines" to make "wads"of money -probably the origin of that term. Poor Black Sal was eventually hunted down by hounds. By 1832 there is the first record of a pencil factory in Keswick. In the 1850's William Morrow, in the USA, developed a machine capable of making grooves in wooden slats for pencils. By 1851, there were four factories in Keswick. The name was changed to Cumberland Pencil company in 1916. There used to be a lot of "pencil extenders" around to make it easier to use up pencil stubs. In WWII, Britain outlawed the use of the rotary pencil sharpener because it wasted so much wood and core. Hand-sharpening with a knife was the only allowed method. Today, many artists prefer to hand-sharpen to acquire the type of point they prefer. There is often an assumption that a lot of the art supplies so common now have been around "forever", but it was actually 1936 when the first Derwent coloured pencils were made. By 1938 this brand of fine art pencils was sold around the world. Through 1950 to 1960, they were reformulated to use non-toxic materials. In 1974 Britain passed a safety limit on the use of heavy metals in all pencils. Until the mid-20th century, many pencils used to have lead in the outside paint coating so it was possible to get lead poisoning from chewing on pencils. Now, non-toxic paints and lacquers are used. Cumberland pencil launched charcoal pencils in 1994 - and now many artists couldn't do without them! Another innovation, as recent as 2006, was Inktense, shown above - the first water-soluble ink pencil. It comes in pencil form but a brush and water yields watercolour effects with more intensity than regular watercolour pencils. Another recent development is the Onyx (2008) which is blacker than a 9B pencil. 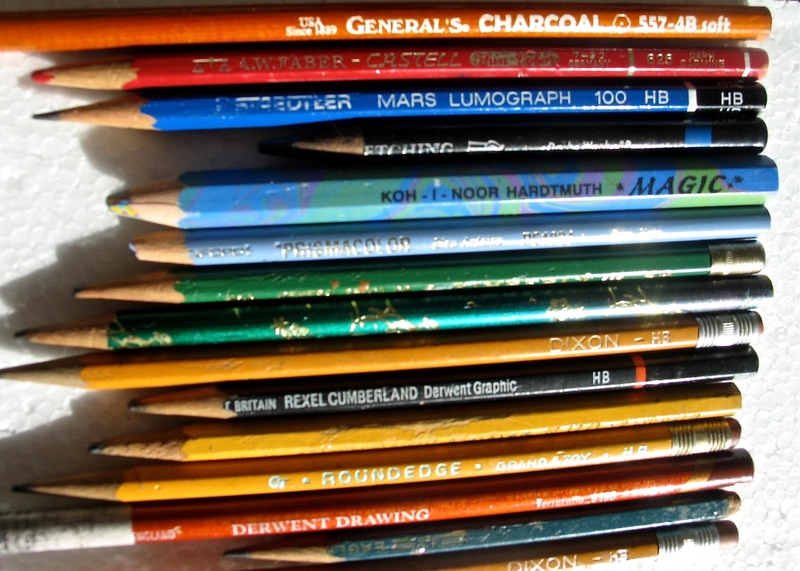 Today we are fortunate to have relatively inexpensive pencils in a variety of hardness, coloured pencils and water-soluble pencils all readily available for our use. We often don't think too deeply about about the tools and materials we use as artists but reading about the recent death of Anton Wolfgang von Faber-Castell made me realize there was a person behind the name seen printed on pencils and I decided to look a bit into the "pencil story". In the picture above, the Faber-Castell pencil is the carmine red one second down. It says "best for print marking" on it and also notes it is "Thin Color" - number 7490 Germany- then- 626 Dark Carmine, so well labelled. Faber-Castell is the oldest pencil-making firm, established as a company in 1761. However, some pencil-making had occurred even earlier. Nuremberg had strict rules governing the trades so when Kaspar Faber (1730-1784), a cabinet-maker, began making pencils in his spare time, he was stretching the rules as he shouldn't have been working with metal as well as the wood. Rules were not as strict in surrounding villages and by the time his son took over the firm, they had a workshop in Stein - which is still the headquarters today. Competition from fine Cumberland graphite used by Derwent resulted in Faber buying the mineral rights to a graphite mine in Siberia. The graphite lumps were transported out on the backs of reindeer. I can visualize a whole line of reindeer packing out the graphite-so now I feel a debt to reindeer. The factory itself was a model of responsible management with male and female workers segregated. The women did lighter chores such as packaging. Management was forward-thinking in other ways as they set up quality housing for workers, created company health insurance and a pension scheme and established a kindergarten in Stein - and all of this around 1844. Napoleon was so impressed he made Faber a member of the Legion of Honour. Castell was added to the name through marriage into nobility. There is more to the story of pencils that I may blog about later - but I have found out that there are even collectors of vintage pencils. I found, however, that a search of my "junk" drawer failed to turn up even one posted on a collector's illustrated "wish list". 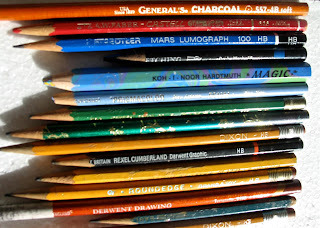 Maybe I will include a pencil in a painting one of these days, but a whole collection of them, as in the photograph, is not a painting subject that appeals to me. However, I am happy to have pencils available for writing and for art - and all at a reasonable price. I hope the reindeer are well-fed! This is a painting from a series I did of close-up views of garden flowers. I call this one "Cleome Squared" because I had an idea - a concept, if you want to call it that- of making a bit of a grid be part of the design of the painting. It is easier to see in the actual painting, but even then you have to look for it. Colours change slightly on the grid. It was rather fun to do and I think adds an extra dimension of interest to the painting, I did a variation of this idea in my "Finn Slough Patchwork" painting - and I may very well play with this idea again - but I would plan on having a finished painting - not just the idea as is so often the case with "conceptual art". The idea is enough, say "Conceptual Artists", you don't have to see it through.and actually produce something. I read about a teacher brought in to do a course on conceptual art at an art school - no names mentioned to protect the guilty. Instead of teaching, he spent his time digging a hole - and the administrators thought this was brilliant and put it down as a high point in conceptual art. There is no mention of what the students who paid for the course thought about the non-instruction. I think you have to have an idea behind a painting to have a good painting. There has to be a reason for painting the subject. The thought behind the painting may, or may not, be conveyed to the viewer since the viewer also brings his or her own thoughts to the viewing - but I think it makes a stronger painting. Once you know there is a grid to this painting, it becomes a bit of a challenge to find where it is and look for colour changes beyond what light and shadow might be doing anyway. Labels: "Cleome Squared", colour changes, conceptual art, ideas behind a painting, imposed grid, is just the idea enough? This is a new one just completed. I used it on my February newsletter but it doesn't show it all, because of the shape. Originally, I wanted to have blue and white stripes in the background but the piece of cloth I was *sure* I had, couldn't be found so I ended up with plain blue instead. The stripes probably would have changed the whole mood of the painting, so maybe it was all for the best. I've just been reading that sales are down in some areas at the high-priced art auctions. I think it is unfortunate that people often don't trust their own eyes and follow what they personally like. According to the article, the really rich are still buying as "every collection has to have a Picasso, a Richter, a Warhol". Buying by "signature" is sad, I think. There is a lot of good art out there- a lot of it very affordable and something that a person can continually enjoy. There are Picassos I like, and lots that I wouldn't want on my wall if I was among the very rich. Why not just have what you like?